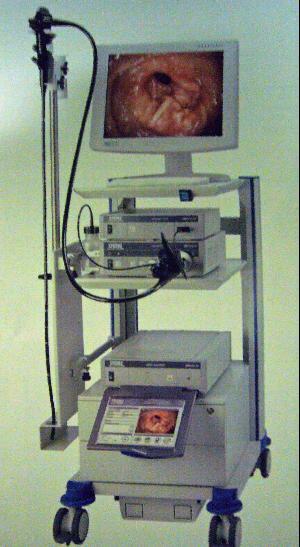 Endoscopy is the Examination of (-scopy) the inside (endo-). A lighted tube is used to see and potentially get a biopsy from structures not usually accessible via other common routes. It avoids major surgery however does require general anesthesia. Since it is minimally invasive, there are few to no side effects associated with the procedures. Procedures that we perform include: Gastroduodenoscopy (Stomach and upper Small Intestines) and Colonoscopy (Colon and potentially some Ileum). Indications for a Gastroduodenoscopy include: chronic vomiting with or without blood, foreign body removal, chronic small bowel diarrhea, protein losing enteropathy, stomach tube placement (gastrotomy), and therapeutic monitoring. Indications for a Colonoscopy include: chronic large bowel diarrhea with or without blood, formed stool associated with tenesmus, mucus, or blood, and therapeutic monitoring.